Michelle Obama graces the October covers of Essence and InStyle magazines, and she looks incredible! The 52-year-old First Lady sported a tailored teal dress designed by Brandon Maxwell, a friend of Lady Gaga, for InStyle. 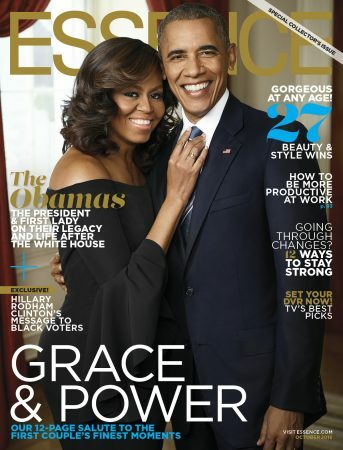 In Essence magazine, Mrs. Obama is seen wearing a beautiful full-sleeved, off-the-shoulder black dress, as she poses next to her husband, Mr. President Barack Obama. Let’s find out how this mom-of-two stays in shape. Michelle Obama may not be America’s First Lady for much longer, but that doesn’t mean she hasn’t left a lasting impression on us. As the first African-American family to occupy the White House, the Obamas have demonstrated that dreams can come true for all people. Michelle Obama is an icon for all women. She personifies strength and she’s got some killer muscular arms that many women want. She works hard to get them, too. Here are some of her secrets to healthy living. First of all, Michelle Obama sticks to a simple diet plan. She eats five small meals per day and sticks to healthy and nutritious foods. She doesn’t count calories or follow anything too restricting. Her philosophy is to listen to her body. She eats something nutritious when she feels hungry and avoids food when she is not hungry. Sounds like a simple recipe to follow, right? This method of eating small meals throughout the day helps to keep blood sugar levels balanced. It also helps to prevent one from feeling hungry and overeating. 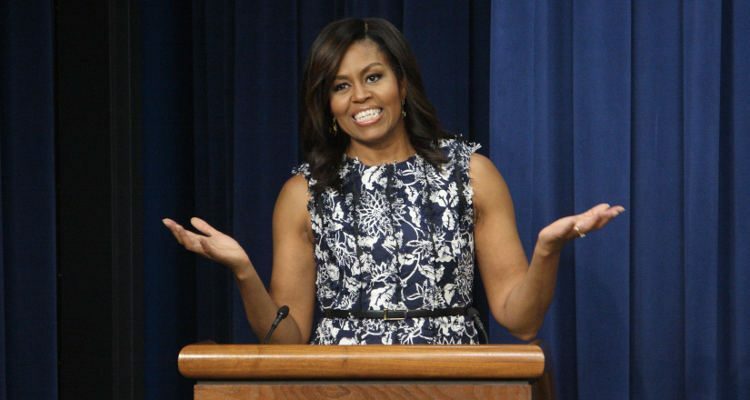 When it comes to her fitness, you better believe Michelle Obama has a workout routine. She works out first thing in the morning to avoid making excuses not to go later in the day. Exercising first thing in the morning is a great way to get your heart pumping and set yourself up for a great day with a vital boost. Obama will do resistance training and cardio on the elliptical or treadmill while watching SportsCenter to keep her entertained. To get her chiseled arms, Obama does exercises like push-ups, triceps dips and hammer curls. She does a combination of weight lifting and strength training to tone her shoulders and arms. When she is on the road, she is sure to bring workout equipment with her and doesn’t rely on going to hotel gyms. She takes a resistance band and a jumping rope with her so that she can ensure she gets in her 30-minute workout in the morning. She does exercises like jump rope, jumping jacks and push-ups. This goes to show that Michelle Obama practices what she preaches. As she founded the “Let’s Move!” campaign to improve fitness and health across schools in America, she makes sure she tends to her own fitness! Clearly she is doing something right. 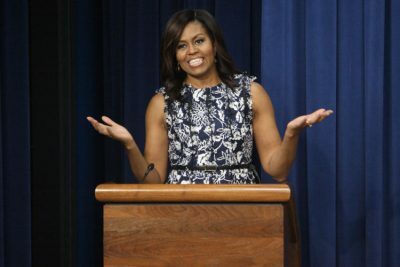 Michelle Obama shows how easy it can be to maintain a healthy lifestyle by choosing healthy foods, eating five meals per day and making sure to get in a minimum 30-minute workout every day, no matter what. Her methods are not complicated; they are simple and effective and accessible to almost everyone. So try the Michelle Obama fitness routine and get moving! 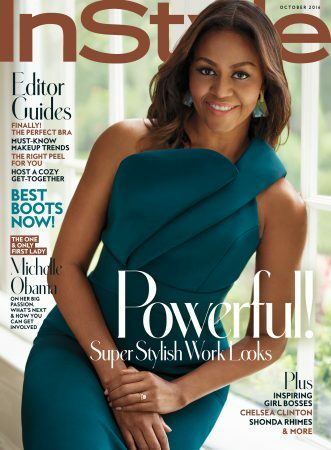 Puente, M., “Michelle Obama stuns in Brandon Maxwell on cover of ‘InStyle’” USA Today website; September, 8, 2016; http://www.usatoday.com/story/life/entertainthis/2016/09/08/obamas-in-style-ssence-magazine-covers/89992036/; last accessed September 10, 2016. “Michelle Obama’s Fitness Routine and Diet Plan” Pikastar website; http://pikastar.com/michelle-obamas-fitness-routine-and-diet-plan/; last accessed September 10, 2016.